Counting down the days until summer? We are too. And as a working gal, that means adjusting outfits to the summer heat while remaining appropriate and professional. Here are five fun pieces to try. 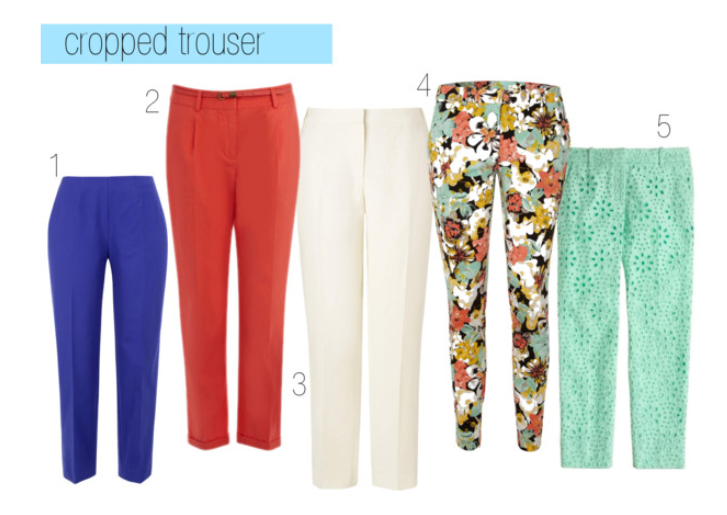 Pants are always appropriate for the office, and if you wear a lighter fabric with a pinch of a higher hemline, you will be oh-so-ready for summer. Bright colors and floral prints can only help your cause. Pair with your favorite flats or heels and perhaps a complementing blazer for the finished look. Put on this one-piece button down, slide into your favorite pumps and grab the car keys because you’re ready to go. 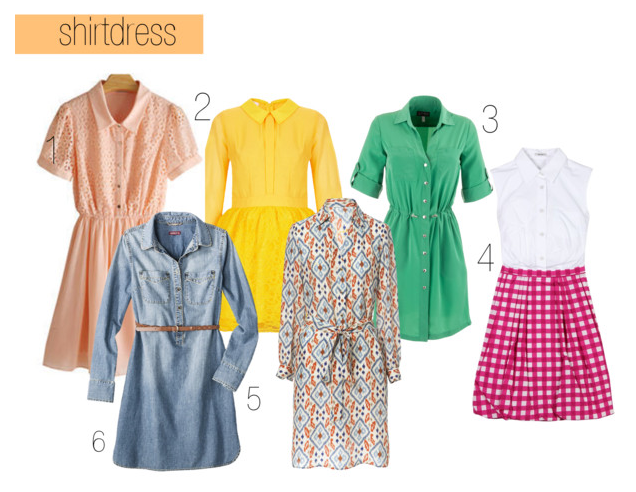 Sporting a shirtdress is easy breezy, and if you wear one with long sleeves, there is no need to tote around a cardigan. Perhaps this piece is more for the business casual crowd, but all in all it’s a fabulous choice for comfort and cuteness. Sometimes a lady just needs to wear a suit, and that’s fine! But every once in a while put a little pep in your step by pairing it with a lovely peplum shell. It gives fun and feminine flair under that serious suit. *Remember this is recommended to be worn under a blazer, jacket, etc. Depending on your office dress code, your company may or may not allow a summery sandal. But never fear! You corporate working gals can have just as much fun with a peep-toe pump or wedge. This classy style lets your feet breathe and your pedicure show, all while remaining positively professional. 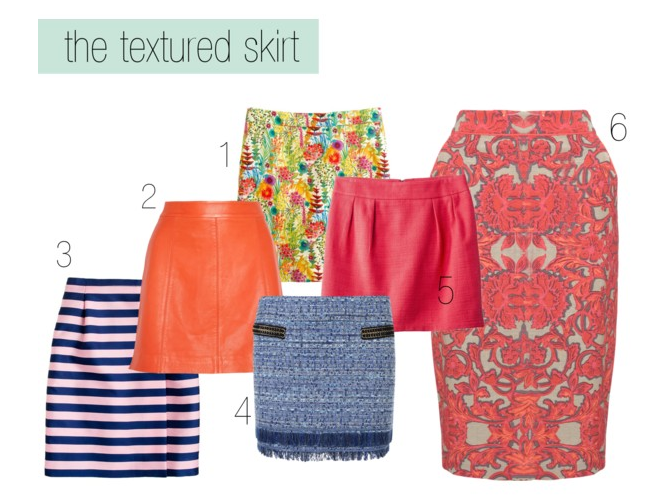 A skirt is a lady’s best friend in the heat of summer. Not only can you perk up your bottom ensemble with bold prints and happy colors, but you can also try incorporating various textures such as lace, tweed and leather. Who’s stopping you? *Whatever you wear, wherever you work, don’t forget these top five no-nos concerning the workplace wardrobe. 1. No sheer or see-through clothing. Just because you have plans after work, doesn’t mean they should interfere with work wardrobe policies. Besides, offices are most likely a little chilly. 2. No flip flops, sneakers, sandals. Unless you work at a super laid back company, or perhaps you happen to be the next Steve Jobs, you gotta dress the part, head to TOE. 3. No plunging necklines. One open button should be enough. Please refer back to no-no #1. 4. No sleeveless shirts. This rule generally applies to the more business formal workplaces. But for the most part, it’s a good rule to follow, and it’s never a bad idea to have a light layer whether cotton cardigan, linen blazer or even a simple cap-sleeve. 5. No shorts. Is an explanation even necessary?